Automation is taking over across industries, allowing companies to increase the efficiency of their operations and inject a mechanical precision into proceedings. In a field so craft focused as winemaking, removing the human element may seem concerning to some. However, the science of the field is so paramount as to make it a perfect industry to employ robotics. The farming aspects present on the vineyard are perhaps some of the most obvious examples being developed even more broadly than in the winemaking industry, but elsewhere work is being done to bring the precision of artificial intelligence to every stage of production. The question is whether or not the industry is set to become almost entirely founded on the work of automation. Within the winemaking industry, automation is perhaps most likely to make its presence felt in the vineyards. As with the broader agricultural industry as a whole, winemaking’s plantations are ripe for the efficiency measures that can be brought in by the use of robotics. More specifically, farms, fields and vineyards are benefitting from the large amounts of data that can be gained through the implementation of robots. Using creations such as the Vinbot, vintners are able to gather vast amounts of information about their vineyards through a combination of machine vision and cloud computing. Vinbot, for example, offers assessment of everything from shoot-tip stress to berry and cluster shape and size. The employment of such robotics, and the broader implementation of precision viticulture, allows vintners to more accurately estimate yield amount and thus better organise the production and marketing of their wine. By applying precision viticulture techniques, and leveraging available automation, winemakers can unlock reams of information and drastically improve efficiency. With a craft so rooted in the knowledge of a range of variables, expanding the data set available can only help to produce better wine in greater quantities. The work being done to broaden the scope of robotics within the winemaking industry is not limited to the vineyards however, as innovation is occurring within the winery as well. While robotic bottling and palleting lines are helpful, the true change is occurring with devices such as Enosis Meraviglia’s Genesis. The invention of Donato Lanati, founder of Enosis Meraviglia and a prominent oenology consultant in Europe, Genesis is a robotic fermentation tank. Genesis comes with its own scale to weigh the grapes, an internal press to create the juice and measure its volume and sensors that can identify the grape variety, including the grape’s region of origin. Within the tank, an incubator handles fermentation, with temperature constantly controlled. Additionally, Genesis gathers biochemistry information on a continuous basis, monitoring the wine’s chemistry as it changes across the course of fermentation. With the amount of data garnered from such a machine, it is possible that Genesis will serve in the future not so much in replacement of a human winemaker but as a prominent tool to more precisely ‘programme’ a wine. “The almost-human extraterrestrial has a superior mind, but especially a big heart,” Lanati told Sputnik News, after creating Genesis in a bid to make better wines. While the majority of investment in bringing automation to the manufacturing side of wine, there are steps being taken to also advance the consumer experience with the introduction of smart devices such as Vinfusion. Designed to counter the average drinker’s lack of detailed wine knowledge, the machine allows users to blend a glass of wine based off customised variables that should allow a customer to produce a glass of wine perfectly fit to their taste. 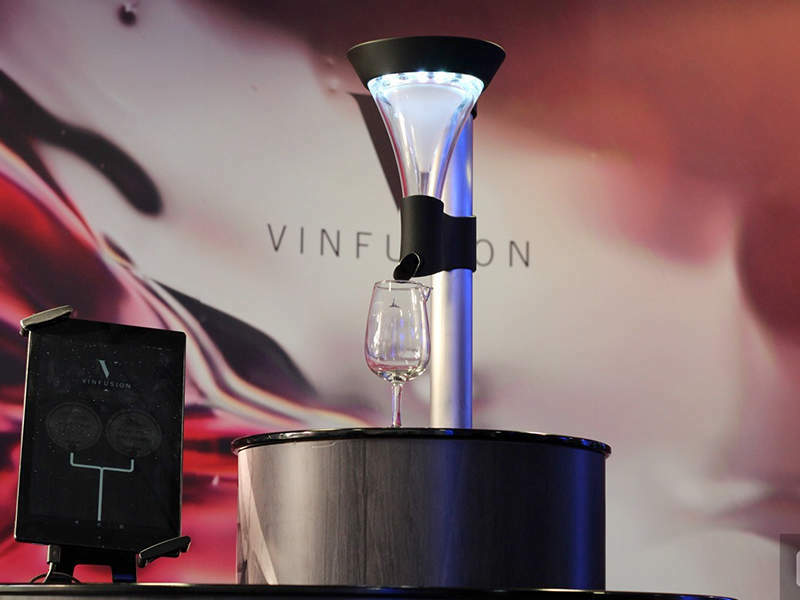 Developed by Cambridge Consultants, Vinfusion is not unique in it being a machine to blend wine but rather that the developers believe they have uncovered the elements of taste that define what anyone may be looking for in a glass of wine. Theoretically, with these elements defined, the device should be able to produce a blend to satisfy any customer. Vinfusion does so through an app that allows you to customise the blend based off three sliders, balancing between light and full-bodied, soft and spicy, and sweetness. Once you’ve made your selection, the Vinfusion machine pulls up the requisite mix from the reservoirs of wine it holds (for red wine for example it would hold a Pinot Noir, a Shiraz, a Merlot and a red Muscat) into a centrifuge that then blends and aerates the mix into the desired blend. By bringing automation to the consumer field, such devices may allow customers to engage with wine in a way that is often seemingly limited by esoteric knowledge and class barriers. By allowing the technology to do the work for you, devices such as Vinbot can deliver quality in a way that would usually require the services of a sommelier.